The impact of natural products on modern society is indisputable given their importance to medicine. As one example, 42% of anticancer and 47% of anti-infective agents introduced over the past 25 years are natural products. While remarkable discoveries have been made, the rate of natural product discovery has declined in recent years, profoundly affecting the development of new therapeutics and the related pharmaceutical and biotechnology industries. The general aim of many projects in our lab is to conduct research in natural products chemistry and associated microbiology and genetics to develop innovative methods to improve natural product discovery from microbes of marine origin. The pseudopterosins are a family of diterpene glycosides isolated from the gorgonian Pseudopterogorgia elisabethae. To date, 26 derivatives have been identified (PsA – PsZ) and in most cases, pseudopterosins represent 2-5% of the crude extract. The pseudopterosins are anti-inflammatory and analgesic agents with potencies superior to that of existing drugs such as indomethacin in mouse ear models. They are not active against PLA2, cyclooxygenase and cytokine release or as regulators of adhesion molecules. Evidence suggests the pseudopterosins block eicosanoid release rather than biosynthesis in murine macrophages. Recent data from the Jacobs laboratory (UCSB) indicates that pseudopterosins inhibit inflammation by a novel mechanism suggesting that these metabolites represent a novel class of anti-inflammatory agent. Importantly, one of the pseudopterosins has a substantial commercial market as an additive in personal care products and a simple derivative of pseudopterosin A, methopterosin, has successfully completed a Phase II clinical trial as a topical anti-inflammatory agent. We have a long-standing interest in the biosynthesis of these marine metabolites. We have elucidated the biosynthetic origin of pseudopterosins from geranylgeranyl diphosphate through a series of radiolabeling experiments as well as detailed NMR-directed investigations (Coleman and Kerr 2000, Kohl and Kerr 2003, Ferns and Kerr 2005a, Ferns and Kerr 2005b, Kerr et al. 2006). One of the key steps in the production of the pseudopterosins (and all terpenes) is the cyclization of the appropriate polyprenyl diphosphate. Knowledge of the structure of the cyclase product involved in pseudopterosin biosynthesis provided us with an assay to purify the enzyme responsible for this transformation. This enzyme (elisabethatriene synthase) has been purified to homogeneity (Kohl and Kerr 2004, Brueck and Kerr 2006). A biosynthetic question that is currently under investigation is whether pseudopterosins are produced by the invertebrate host or an associated microbe. Microbes (bacteria and fungi) are the source of all our natural products investigations and are obtained from a wide diversity of marine habitats. The marine environment represents an underexplored resource for microbial natural product discovery thus improving the likelihood of isolating new compounds. We are interested in projects directed at assessing microbial diversity using both culture independent and culture dependent methods. As is evident from the Field Work tab on this web page, we have on-going collection programs in Canada’s Arctic, Colombia, the Mediterranean, the Black Sea, The Bahamas as well as Atlantic Canada. This project represents an exciting collaboration between our group at UPEI, Nautilus Biosciences Canada and Croda International, a world leader in specialty chemicals. The collaboration aims to harness the chemical production capabilities of microbes of marine origin for the sustainable production of active ingredients in personal care products. To achieve this goal, we will expand the existing marine microbial collection (the Marine Natural Products Bank, MNPB) through collections of marine sediment, algae and invertebrates in diverse geographic locations. Microbes will be purified from these samples and fermented under conditions designed to produce natural products with specific properties. Specifically, extracts of cultured microbes will be tested for the presence of biosurfactants, bioemulsifiers, antimicrobial agents, biofilm dispersants, UV protectants, antioxidants and keratinases. These activities have been identified as key to personal care products being developed by Nautilus partner Croda. In collaboration with Nautilus and AB Vista, we are screening our marine microbial library for enzymes with applications as a feed additive for the ruminant feed industry which can increase fibre digestion. The overall goal of this project is to identify new novel xylanase, cellulase and endoglucanase activities and accessory enzymes (arabinofuranosidase, xylosidase and glucuronidases) which can be used to develop a new ruminant feed additive which will increase feed efficiency and productivity. The Kerr Lab is ideally located on the University of Prince Edward Island campus in Charlottetown, PE. The bacterial and chemical divisions of the lab are centred in the Regis and Joan Duffy Research Centre. The fungal division of the lab as well as our antibiosis/cell screening division are located in the North Annex of the Atlantic Veterinary College. 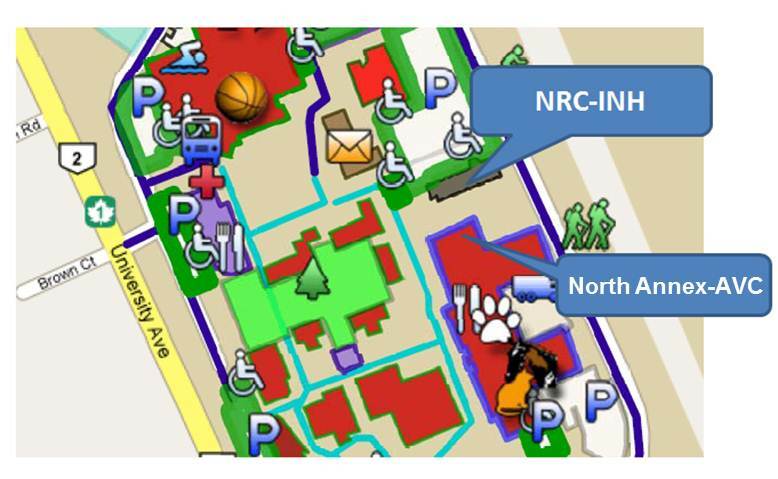 To access an interactive map, please click on the campus map to the left. The Regis and Joan Duffy Resaerch Centre, is home to researchers from UPEI, the National Research Council Institute for Nutrisciences and Health (NRC-INH), and Agri-Food Canada (AAFC). Here they share knowledge, lab space, and specialized equipment and tools as they explore how natural compounds can be used to prevent and treat disease in animals and humans, contributing to the island's growing bioscience cluster. The Regis and Joan Duffy Research Centre boasts an open concept lab environment, which facilitates both the sharing of equipment and knowledge among the researchers. Both the Chemical and the Bacterial divisions of the Kerr Research lab are located on the fifth floor. The North Annex expansion of the Atlantic Veterinary College (AVC) at the University of Prince Edward Island (UPEI) includes both office and laboratory space. Both the Fungal and the Bioassay (antimicrobial and cell based assay) divisions of the Kerr Research lab are located in our Biosafety Level 2 laboratory at 3rd flour in the North Annex of the AVC. Additional to our laboratory space, our group also has recourse to Multi User space and equipment that are made available from AVC. The lab located on the fifth floor of the Duffy Research Centre forms the base of operations for bacteriology and chemistry oriented research in the Kerr Lab. The lab houses a wide selection of equipment need for microbiology, molecular biology and chemisty research. To support our natural products chemistry research the lab is equiped with eight fume hoods, four rotary evaporators, two vacuum evaporators (GeneVac), an automated flash chromatography system (Teledyne Combiflash Rf), a Thermo Scientific GCMS and four HPLC systems, one of which is connected to a mass spectrometer to enable mass-guided fractionation. The crown jewels of the lab are two Thermo Scientific Orbitrap high-resolution mass spectrometers (Exactive and Velos models), which are both connected to ultra-high performance liquid chromatography (UPLC) systems. For natural product structure elucidation a 600 MHz Bruker NMR (housed in the Duffy Research Centre) is made availabe via an agreement with Agriculture and Agri-food Canada. To support molecular biology research, the lab is equiped with two gradient-capable PCR thermocyclers, a UVP molecular imager, a Bio-Rad Duo-Flo FPLC system and a variety of electrophoresis supplies. Microbiology-related equipment includes three New Brunswick Innova 44 shaking incubators, a large ambient temperature platform shaker, two laminar flow hoods, a type II biosafety cabinent, a variety of microscopes and a Steris autoclave. The lab is also equiped with common general use equipment including multiple balances, centrifuges and stationary incubators, two ultralow temperature freezers, two dishwashers and a Millipore MilliQ deionized water system. A graphical represenation of the lab layout and pictures of various spaces and equipment are shown below. Our HRMS instruments are the crown jewel of the lab! The instrument on the left is the Thermo Scientific Exactive HRMS. This instrument is coupeld to a UPLC chromatography system as well as a PDA detector and a universal evaporative light scattering detector (ELSD). This instrument provides an ideal platform for the rapid screening of natural product extracts. The instrument on the right is the Thermo Scientific Orbitrap LTQ-Velos. This instrument is also coupled with a UPLC and PDA detector. Using either ESI or APCI ionization sources, this instrument is ideal for the quantification and identification of natural products from pure samples or mixtures. This instrument can also perform tandem mass spectrometry MS(n) experiments to assist researchers with the structure elucidation of unknown molecules. Our GCMS instrument is a Thermo Scientific Focus GC, which is coupled with a Polaris Q quadrupole ion trap mass analyzer equiped with electron ionization source. This system is ideal for characterizing non-polar metabolites not compatable with reversed-phase LC. A recent addition to the lab is a Waters HPLC system coupled to a mass-guided fraction collector. The system consistes of two Waters HPLC pumps, a Waters 3100 single quadrupole mass spectrometer and a Waters 2767 fraction collector. This system is designed for both analytical and semi-preparative separations. A second Waters HPLC system is also available for analytical and semi-preparative separations. This system features a manual injector, a Waters 1525 binary HPLC pump, a Waters 2489 dual channel UV/Visible detector, a Waters 2424 ELSD and a Waters 2767 fraction collector. Our Thermo Scientific HPLC system features a Finnigan Surveyor Autosampler Plus, LC Pump Plus, and PDA Plus detector. It is also conntected to a SEDEX 60 LT ELSD. The system is designed for both analytical and semi-preparative separations. The latest model in medium-pressure chromatography from Teledyne Isco, the CombiFlash RF, is compact and user-friendly. The system is equipped with radio frequency identification (RFID) technology to allow for automation of parameters for purification and fraction collection. Evaporation is a common occurence in the purification of any natural product. To facilitate rapid evaporation of samples, the lab is equiped with four rotary evaporators (top photo) and two GenVac vacuum evaporators. The GeneVacs are ideal for drug discovery applications as the GeneVac EZ-2 Plus is capable of evaporating all commonly used solvents and most acids quickly and effectively. To facilitate bacterial fermentation, the lab is equipped with four shakers. One is a large ambient temperature platform shaker (bottom photo). The other three (top photo) are temperature controlled Innova 44 shaker incubators. One of these is a refridgerated unit, which allows us to explore the effect of temperature on natural product production. The molecular biology room (Rm 517) contains two gradient-capable thermal cyclers (Eppendorf and Bio-Rad), electrophoresis equipment, an incubator and a laminar flow hood. 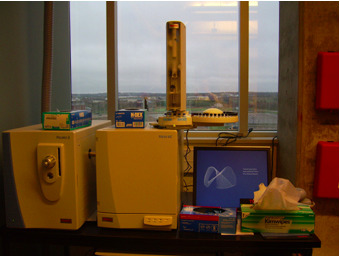 To support molecular biology activities the lab is equiped with a Bio-Rad Duo-Flo FPLC (top photo) system, which is used to purify proteins and other biomoleculres. Molecular imaging needs are met by the UVP BioSpectrum imaging system (bottom photo). A multitude of equipment is avialable for general use in the lab including (clockwise from top right) a compound microscope, a -80oC freezer, a Beckman Coulter Allegra 25R centrifuge, a freeze dryer and type II biosafety cabinet. Room 509 is a common area that houses the autoclave, as well as the dish washers and the Millipore MilliQ deionized water system. This laboratory space is focused upon fungal isolation, fermentation and extraction in addition to the preparation and evaluation of antimicrobial assays. Several mulit-user locations are also available on the 3rd floor of the North Annex, where we carry out media preparation, PCR amplification, and cell culture work (in a dedicated cell culture lab). Various incubators allow for culturing pathogens for antimicrobial assays at various temperatures. Temperature controlled shaking incubator where we can carry out shaken fermentations of various volumes ranging from 20 mL - 2 L.
Temeperature controlled standing incubator where we culture our fungi and carry out static fermentations. Chemistry work station: fumehood and lab bench. Various tools are available for the extraction and processing of fungal fermentations. Microscopy work station: Disecting scope and compound microscope used for morphological identification. Shaking Incubator used for culturing seed inoculum for fermenations and assays. Vacuum concentrator (SpeedVac) used for extract evaporation when generating mother/daughter plates for antimicrobial assays. Spectrophotometer/Fluorometer and stacking robot used for evaluating results from 96 well assay plates. Various bench spaces are available to carry out routine lab activities such as DNA extraction and assay plate preparation. Demonstration of water pumping action of a sponge. The town of Kas, Turkey – the departure location of one of our dive trips. Brad – collecting in the murky waters. Bulent (our local guide and sponge taxonomist) with Brad on hotel balcony (= temporary lab). Brad processing samples in hotel room. The group visiting the Columbus monument. A picnic in the back of one of the Gerace trucks! Setting up a gorgonian Aquaculture project. Canada's arctic is a cold and forbidding region of the world. This diverse area is often thought to be relatively devoid of biolgical diversity and most people associate the arctic with relatively few large mammals such as polar bears, muskox, seals, walruses and whales, as well as a variety of migratory bird species. This view of the arctic largely ignores microbial diversity. Several studies in the arctic have examined general bacterial diversity of tundra and the diversity observed has rivalled that of tropical soils. The majority of the studies conducted to date have been concerned with bacterial diveristy as it relates to climate change and bioremediation of contaminated soils. The aim of the 2011 expedition to Iqaluit was to obtain a number of terrestrial soil and intertidal marine sediment samples so that we could assess microbial diversity of this arctic region from a natural product discovery perspective. We will characterize the microbial diversity using a combination of culture independent and culture dependent methodologies. We will subsequently evaluate bacteria cultured from these samples for the ability to produce novel bioactive metabolites. Our hypothesis is that novel bacterial and fungal biodiversity will be discovered from arctic samples which will coincided with the production of novel natural products from these unique microbes. Iqualuit, view from western shore of Frobisher Bay. View looking over Iqaluit into Frobisher Bay. Nunavut Arctic College Old Residence - my home for a week. Nunavut Research Institute - research facilities. Nunavut Research Institute Lab - very nice labs!! Many thanks to the faculty and staff at the Nunavut Research Institute for their help throughout the duration of the collecting expedition. My trusty steed for the week - a Yamaha Big Bear ATV. Self portrait of Brad Haltli collecting samples in the tundra. Tarr Inlet south east of Iqaluit at extreme low tide. Inlet on west side of Frobisher Bay at extreme low tide. Silvia Grinnell River in Silvia Grinnell Territorial Park. View from Qaummaarviit Territorial Park into Frobisher Bay. Collecting site south of Iqaluit. Collecting site south of Iqaluit at low tide. Collecting site on the tundra. Arctic Cotton Grass in foreground. The 4 Corners - cross roads in the heart of Iqaluit. Polar bear.....luckily the closest I came to seeing a polar bear was this stuffed specimen at a museum in Iqaluit . Tundra surrounding Iqaluit from the airplane. Silvia Grinnell River from the airplane. Highlands west of Iqaluit.....snow on September 3rd!!! Jennifer Cuillerier, Rebecca Pike, Beth Pearce (grad students) Brad Haltli, and Russ Kerr spent a week in Barbados to conduct field work. We were joined by two graduate students in Dr. Tinto’s group – Ann Seebaran and Troy Cumberbatch. Collections of invertebrates were conducted for the purpose of isolating microbes for drug discovery projects, and Jenn, Becca and Beth conducted field work for a Marine Natural Products course. taxonomist (UWI) joined us for a few dives. One of the colourful dive boats that we used. Fabrice Berrue, David Overy and Russ Kerr traveled to Barbados to initiate a collaboration with Dr. Winston Tinto (University of West Indies, Cave Hill). Collections were focused on the south coast of the island using the services of EcoDivers. The goals of the trip were to collect invertebrates and algae and also to isolate microbes from selected invertebrate samples. Fabrice – ready to dive! During the summer of 2009 we enjoyed various collecting trips to regions of PEI, the Bay of Fundy and Newfoundland. In August, we visited the Gerace Research Centre located on San Salvador in the Commonwealth of the Bahamas. This was a highly successful trip with samples collected from a variety of habitats including reefs, caves and marine lakes. Samples are now being processed for our drug discovery program and microbiological studies. An aereal view of the airport on San Salvador - one of our dive sites is directly off shore from the runway. Our dive boat for the week. Stacey meets a very friendly grouper known by the locals as Sponge Bob! A specimen of Pseudopterogorgia elisabethae in the ziploc bag ready for micro work back at the lab. Collecting a gorgonian for microbiological work. Brad and Fabrice collecting Erythropodium. Brad - off to the lab. Veronica and Brad processing samples for microbiological work. 10.3390/md15090262. PubMed PMID: 28832545; PubMed Central PMCID: PMC5618401. 119. Overy D, Correa H, Roullier C, Chi WC, Pang KL, Rateb M, Ebel R, Shang Z, Capon R, Bills G, Kerr R. Does Osmotic Stress Affect Natural Product Expression in Fungi? Mar Drugs. 2017 Aug 13;15(8). pii: E254. doi: 10.3390/md15080254. PubMed PMID: 28805714; PubMed Central PMCID: PMC5577608. 118. Grunwald AL, Berrue F, Robertson AW, Overy DP, Kerr RG. Mortiamides A-D, Cyclic Heptapeptides from a Novel Mortierella sp. Obtained from Frobisher Bay. J Nat Prod. 2017 Oct 27;80(10):2677-2683. doi: 10.1021/acs.jnatprod.7b00383. Epub 2017 Sep 18. PubMed PMID: 28921982. 117. Forget SM, Robertson AW, Overy DP, Kerr RG, Jakeman DL. Furan and Lactam Jadomycin Biosynthetic Congeners Isolated from Streptomyces venezuelae ISP5230 Cultured with N(ε)-Trifluoroacetyl-l-lysine. J Nat Prod. 2017 Jun 23;80(6):1860-1866. doi: 10.1021/acs.jnatprod.7b00152. Epub 2017 May 18. PubMed PMID: 28520425. 116. Abd-El-Aziz AS, Agatemor C, Etkin N, Bissessur R, Overy D, Lanteigne M, McQuillan K, Kerr RG. Quaternized and Thiazole-Functionalized Free Radical-Generating Organometallic Dendrimers as Antimicrobial Platform against Multidrug-Resistant Microorganisms. Macromol Biosci. 2017 Jul;17(7). doi:10.1002/mabi.201700020. Epub 2017 Mar 31. PubMed PMID: 28371348. 115. Robertson V, Haltli B, McCauley EP, Overy DP, Kerr RG. Highly Variable Bacterial Communities Associated with the Octocoral Antillogorgia elisabethae. Microorganisms. 2016 Jul 5;4(3). pii: E23. doi: 10.3390/microorganisms4030023. PubMed PMID: 27681917; PubMed Central PMCID: PMC5039583. 114. Tangerina MM, Correa H, Haltli B, Vilegas W, Kerr RG. Bioprospecting from cultivable bacterial communities of marine sediment and invertebrates from the underexplored Ubatuba region of Brazil. Arch Microbiol. 2017 Jan;199(1):155-169. doi: 10.1007/s00203-016-1290-9. Epub 2016 Sep 19. PubMed PMID: 27644133. 113. McCauley EP, Haltli B, Correa H, Kerr RG. Spatial and temporal investigation of the microbiome of the Caribbean octocoral Erythropodium caribaeorum. FEMS Microbiol Ecol. 2016 Sep;92(9). pii: fiw147. doi: 10.1093/femsec/fiw147. Epub 2016 Jul 4. PubMed PMID: 27381833. 112. Sommer B, Overy DP, Haltli B, Kerr RG. Secreted lipases from Malassezia globosa: recombinant expression and determination of their substrate specificities. Microbiology. 2016 Jul;162(7):1069-79. doi: 10.1099/mic.0.000299. Epub 2016 Apr 29. PubMed PMID: 27130210. 111. Herzog B, Overy DP, Haltli B, Kerr RG. 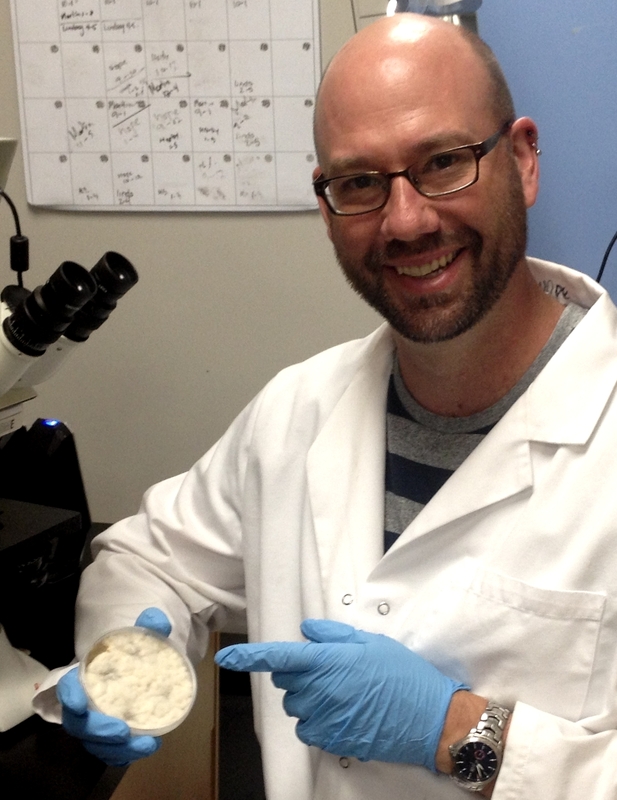 Discovery of keratinases using bacteria isolated from marine environments. Syst Appl Microbiol. 2016 Feb;39(1):49-57. doi: 10.1016/j.syapm.2015.10.004. Epub 2015 Nov 9. PubMed PMID: 26607323. 110. Abd-El-Aziz AS, Agatemor C, Etkin N, Overy DP, Lanteigne M, McQuillan K, Kerr RG. Antimicrobial Organometallic Dendrimers with Tunable Activity against Multidrug-Resistant Bacteria. Biomacromolecules. 2015 Nov 9;16(11):3694-703. doi: 10.1021/acs.biomac.5b01207. Epub 2015 Oct 16. PubMed PMID: 26452022. 109. Johnston CW, Connaty AD, Skinnider MA, Li Y, Grunwald A, Wyatt MA, Kerr RG, Magarvey NA. Informatic search strategies to discover analogues and variants of natural product archetypes. J Ind Microbiol Biotechnol. 2016 Mar;43(2-3):293-8. doi: 10.1007/s10295-015-1675-9. Epub 2015 Sep 8. PubMed PMID: 26350080. 108. Sommer B, Overy DP, Kerr RG. Identification and characterization of lipases from Malassezia restricta, a causative agent of dandruff. FEMS Yeast Res. 2015 Nov;15(7). pii: fov078. doi: 10.1093/femsyr/fov078. Epub 2015 Aug 21. PubMed PMID: 26298017. Aug 13. PubMed PMID: 26270270. 106. Arens JC, Haltli B, Kerr RG. Draft Genome Sequence of Kitasatospora griseola Strain MF730-N6, a Bafilomycin, Terpentecin, and Satosporin Producer. Genome Announc. 2015 Mar 26;3(2). pii: e00208-15. doi: 10.1128/genomeA.00208-15. PubMed PMID: 25814608; PubMed Central PMCID: PMC4384148. 105. Gill KA, Berrué F, Arens JC, Carr G, Kerr RG. Cystargolides, 20S Proteasome Inhibitors Isolated from Kitasatospora cystarginea. J Nat Prod. 2015 Apr 24;78(4):822-6. doi: 10.1021/np501060k. Epub 2015 Mar 13. PubMed PMID: 25769015. 104. McCauley EP, Haltli B, Kerr RG. Description of Pseudobacteriovorax antillogorgiicola gen. nov., sp. nov., a bacterium isolated from the gorgonian octocoral Antillogorgia elisabethae, belonging to the family Pseudobacteriovoracaceae fam. nov., within the order Bdellovibrionales. Int J Syst Evol Microbiol. 2015 Feb;65(Pt 2):522-30. 103. David Overy, Paul Bayman, Russell Kerr and Gerald Bills. An assessment of natural product discovery from marine (sensu strictu) and marine-derived fungi. Mycology: an International Journal on Fungal Biology, 5, 145-167 (2014). 102. David P. Overy, Fabrice Berrue, Hebelin Correa, Novriyandi Hanif, Kathryn Hay, Martin Lanteigne, Kathrine McQuilian, Stephanie Duffy, Patricia Boland, Ramesh Jagannathan, Gavin S. Carr, Marieke Vansteeland & Russell G. Kerr. Sea foam as a source of fungal inoculum for the isolation of biologically active natural products. Mycology: an International Journal on Fungal Biology. DOI:10.1080/21501203.2014.931893 (2014). 101. Krista A. Gill, Fabrice Berrué, Jennifer C. Arens and Russell G. Kerr. Isolation and structure elucidation of cystargamide, a lipopeptide from Kitasatospora cystarginea. J Nat Prod DOI 10.1021/np500122s (2014). 100. Michelle A. Markus, Jonathan Ferrier, Sarah M. Luchsinger, Jimmy Yuk, Alain Cuerrier, Michael J. Balick, Joshua M. Hicks, K. Brian Killday, Christopher W. Kirby, Fabrice Berrue, Russell G. Kerr, Kevin Knagge, Tanja Gödecke, Benjamin E. Ramirez, David C. Lankin, Guido F. Pauli, Ian Burton, Tobias K. Karakach, John T. Arnason, Kimberly L. Colson. Distinguishing Vaccinium Species By Chemical Fingerprinting Based on NMR Spectra, Validated with Spectra Collected in Different Laboratories" Planta Medica 80, 732-739 (2014). 99. Michael R. van den Heuvel, Natacha S. Hogan, Gillian Z. MacDonald, Fabrice Berrue, Rozlyn F. Young, Collin J. Arens, Russell G. Kerr, Phillip M. Fedorak. Assessing accumulation and biliary excretion of naphthenic acids in yellow perch exposed to oil sands-affected waters. Chemosphere 95, 619–627 (2014). 98. E. Marchal, Md. Uddin, D. SMithen, C. Hawco, M. Lanteigne, D. Overy, R. Kerr and A. Thompson. Antimicrobial activity of non-natural prodigiosenes. RSC Advances, 3, 22967-22971 (2013). 97. Gavin Carr, Fabrice Berrue, Saranyoo Klaiklay, Isabelle Pelletier, Russell G. Kerr. Natural products with protein tyrosine phosphatase inhibitory activity. Methods, 65, 229-238 (2013). 96. Rebecca E. Pike, Brad Haltli, and Russell G. Kerr. Description of Endozoicomonas eunicicola sp. nov. and Endozoicomonas gorgonicola sp. nov., Bacteria Specifically Associated with the Gorgonian Octocorals, Eunicea fusca and Plexaura sp., and an emended description of the genus Endozoicomonas. Int. Journal of Systematic and Evolutionary Microbiology 63, 4294 - 4302 (2013). 95. David Forner, Fabrice Berrué, Hebelin Correa, Katherine Duncan, and Russell G Kerr. Chemical dereplication of marine actinomycetes by LC-HRMS profiling and statistical analysis. Analytica Chemica Acta, 805, 70 - 79 (2013). 94. Jennifer Arens, Fabrice Berrue, Jason Pearson and Russell Kerr. Isolation and structure elucidation of satosporin A and B: new polyketides from Kitasatospora griseola. Organic Letters, 15, 3864 - 3867 (2013). 93. Hebelin Correa, Brad Haltli, Carmenza Duque, Russell Kerr. Bacterial Community of the Gorgonian Octocoral Pseudopterogorgia elisabethae. Microbial Ecology 66, 972 – 985 (2013). 92. Ghada Ebead, David Overy, Russell Kerr. Westerdykella reniformis sp. nov., producing the antibiotic metabolites melinacidin IV and chetracin B. IMA Fungus, 189-201 (2012). 91. Fabrice Berrue, Malcolm McCulloch, Patricia Boland, Saskia Hart, Mary Kay Harper, James Johnson, Russell G. Kerr. Isolation of steroidal glycosides from the Caribbean sponge Pandaros acanthifolium. J. Nat. Prod. 75, 2094- (2012). 90. Angela Duque-Alarcon, Lory Santiago-Vazque, Russell Kerr. Microbial community analysis of the octocoral Eunicea fusca. Electronic Journal of Biotechnology, Vol. 15, no. 5 (2012). 89. Malcolm McCulloch, Brad Haltli, Douglas Marchbank, Russell Kerr. Evaluation of pseudopteroxazole and pseudopterosin derivatives against Mycobacterium tuberculosis and other pathogens. Marine Drugs, 11, 1711 – 1728 (2012). 88. Douglas H. Marchbank, Fabrice Berrue, Russell Kerr. Eunicidiol, a new anti-inflammatory dilophol diterpene from Eunicea fusca. J. Nat. Prod. 75 (7), 1289-93 (2012). 87. Hebelin Correa, Fabrice Berrué, Brad Haltli, Carmenza Duque, Russell Kerr. Rapid construction of a library of natural products from the cultivation of 14 bacteria of the phylum Firmicutes, symbionts of the octocoral Pseudopterogorgia elisabethae of Isla de Providencia. J. Colombian Academy of Science (Revista de la Academia Colombiana de Ciencias), 35(136), 337-348 (2011). 86. Malcolm McCulloch, Fabrice Berrue, Brad Haltli and Russell Kerr. One-pot syntheses of pseudopteroxazoles: a rapid route to non-natural congeners with improved antimicrobial activity. J. Nat. Prod. 74, 2250-2256 (2011). 85. Fabrice Berrue, Malcolm McCulloch, Russell Kerr. Marine diterpene glycosides. Bioorganic & Medicinal Chemistry 19, 6702-6719 (2011). 84. Fabrice Berrue, Sydnor T. Withers, Brad Haltli, Jo Withers, and Russell G. Kerr. Chemical screening method for invertebrate-associated bacteria involved in the production of secondary metabolites present in the host organism. Marine Drugs, 9, 369-381 (2011). 83. Douglas H. Marchbank and Russell G. Kerr. Semisynthesis of fuscoside B analogues and eunicosides, and analysis of anti-inflammatory activity. Tetrahedron, 67, 3053-3061 (2011). 82. Hebelin Correa, Fabio Aristizabal, Carmenza Duque and Russell Kerr. Cytotoxic and Antimicrobial Activity of Pseudopterosins and seco-Pseudopterosins Isolated from the Octocoral Pseudopterogorgia elisabethae of San Andrés and Providencia Islands (SW Caribbean). Marine Drugs, 9, 334-344 (2011). 81. Jose Lopez, A. Ledger, Lory Santiago-Vázquez, M. Pop, Llanie Ranzer, Richard Feldman, Russell G. Kerr. Suppression subtractive hybridization PCR isolation of cDNAs from a Caribbean soft coral. Electronic Journal of Biotechnology, 1418 01 (2011). 80. Maysoon Saleh and Russell G. Kerr. Identification of the cyclase product and its first oxidation product in the biosynthesis of fuscol and fuscosides. Aust. J. Chem. 63, 901-906 (2010). Invited contribution. 79. Abhijeet S. Kate, Amber C. Kohl and Russell G. Kerr. A simple and sensitive APCI-LC-MS method for the detection of the antitumor agent, carmustine (BCNU) in rat plasma. J. Liq. Chromatogr. & Related Technol. 33, 818-824 (2010). 78. Abhijeet S. Kate, Kelly Richard, Balaji Ramanathan, and Russell G. Kerr. A halogenated pseudopterane diterpene from the Bahamian octocoral Pseudopterogorgia acerosa. Can. J. Chem. 88, 318-322 (2010). 77. Jose Lopez, Benoit Mouzon, Peter McCarthy, Russell Kerr. The many faces of gene expression profiling: transcriptome analyses applied towards elucidating marine organismal interactions and metabolism. Textbook on Molecular Biotechnology. IK International Publishing House Pvt. Ltd (AUUP), ISBN 978-93-80026-37-4. Pp 287-304 (2009). 76. Abhijeet Kate, Jason Pearson, Balaji Ramanathan, Kelly Richard, Russell Kerr. Isolation, biomimetic synthesis and biological activity of bis-pseudopterane amines. J. Nat. Prod. 72(7), 1331-1334 (2009). 75. Fabrice Berrue, Abdelnasser Ibrahim, Patricia Boland and Russell Kerr. A newly isolated marine Bacillus pumilus SP21: a source of novel lipoamides and other antimicrobial agents. Pure and Applied Chemistry 81, 1027-1031 (2009). 72. Russell Kerr. Pseudopterosin production: the promise and challenges. Chapter in “Vision and Future of Investigations in Parasitology and Natural Products” Republic of Columbia, Bogota, pgs 399 – 410, (2009). 71. Fabrice Berrue and Russell G. Kerr. Dipterpenes from gorgonian corals. Nat. Prod. Rep., 26, 681–710 (2009). 70. Llanie K Ranzer, Thomas Brueck, Wolfram Brueck, Jose Lopez, Russell Kerr. A new prokaryotic farnesyldiphosphate synthase from the octocoral Eunicea fusca: differential display, inverse PCR, cloning and characterization. Marine Biotechnology, 11, 62 (2009). 69. Abhijeet Kate, Isabelle Aubry, Michel Tremblay and Russell Kerr. Lipidyl pseudopteranes A-F: isolation, biomimetic synthesis and PTP1B inhibitory activity of a novel class of pseudopteranoids from the gorgonian Pseudopterogrogia acerosa. J. Nat. Prod., 71, 1977-1982 (2008). 68. Angela P. Duque-Alarcón, Lory Z. Santiago-Vázquez, Julie Enticknap, Nasser Alam and Russell Kerr Diversity of Coral Eunicea fusca Associated Bacteria Using Culture Dependent Techniques. Res. J. Microbiol. 10: 614-621, (2008). 67. Mohammad Al-Ghoul, Thomas Brueck, Janelle Lauer-Fields, Victor Asirvatham, Claudia Zapata, Russell Kerr and Gregg Fields. Comparative proteomic analysis of matched primary and metastatic melanoma cell lines. Journal of Proteome Research, 7 (9) 4107–4118, (2008). 66. Jamie L. Frenz-Ross, Julie J. Enticknap and Russell G. Kerr. The effect of bleaching on the terpene chemistry of Plexaurella fusifera: evidence that zooxanthellae are not responsible for sesquiterpene production. Marine Biotechnology, 10, 572-578 (2008). 65. Lory Z. Santiago-Vázquez, Thomas B. Brück, Wolfram M. Brück, Angela P. Duque-Alarcón, Peter J. McCarthy and Russell G. Kerr. The diversity of the bacterial communities associated with the azooxanthellate hexacoral Cirrhipahtes lutkeni. Journal of the International Society for Microbial Ecology, 1, 654-659 (2007). 64. Lory Z. Santiago-Vázquez, Nealie C. Newberger, and Russell G. Kerr. Cryopreservation of the dinoflagellate symbiont of the octocoral Pseudopterogorgia elisabethae. Marine Biology, 152, 549-556 (2007). 63. Thomas Brueck, Wolfram Brueck, Lory Z. Santiago-Vázquez, Peter McCarthy and Russell G. Kerr. Diversity of the bacterial communities associated with the azooxanthellate deep water octocorals Leptogorgia minimata, Iciligorgia schrammi and Swiftia exertia. Marine Biotechnology, 9, (2007). 62. Xing Dai, Zhongliang Wan, Russell G. Kerr, and Huw M. L. Davies. Synthetic and isolation studies related to the marine natural products (+)-elisabethadione and (+)-elisabethamine. J. Org. Chem. 72, 1895-2000 (2007). 61. Lory Z. Santiago-Vázquez, Llanie K. Ranzer, and Russell G. Kerr. Comparison of two total RNA extraction protocols using the marine gorgonian coral Pseudopterogorgia elisabethae and its symbiont Symbiodinium sp. Electronic Journal of Biotechnology, 9(5), (2006). 60. M. Isabel Nieto, Noemi Gonzalez, Jamie Rodriguez, Russell G. Kerr and Carlos Jimenez. New cytotoxic cembranolides: isolation, biogenetic studies and synthesis of analogues. Tetrahedron 62, 11747-11754 (2006). 59. Nealie Newberger, Llanie Ranzer, Jennifer Boehnlein and Russell Kerr. Induction of terpene biosynthesis in the dinoflagellate symbionts of the Caribbean gorgonian corals of the genera Pseudopterogorgia and Eunicea. Phytochem. 67, 2133-2139 (2006). 58. Russell G. Kerr, Amber Kohl and Tyrone Ferns. Elucidation of the biosynthetic origin of the anti-inflammatory pseudopterosins. J. Ind. Microbiol. Biotechnol. 33, 532-538 (2006). 57. Thomas Brueck and Russell Kerr. Purification and kinetic properties of elisabethatriene synthase from the coral Pseudopterogorgia elisabethae. Comp. Biochem. and Physiol. Part B 143, 269-278 (2006). 56. Tyrone Ferns and Russell Kerr. Oxidations of erogorgiaene in pseudopterosin biosynthesis. Tetrahedron 61, 12358-12365 (2005). 55. Jennifer Boehnlein, Lory Santiago-Vazquez and Russell Kerr. Diterpene biosynthesis by the dionflagellate symbiont of the Caribbean gorgognian Pseudopterogorgia bipinnata. Mar. Ecol. Prog. Ser. 303:105-111 (2005). 54. Tyrone Ferns and Russell Kerr. Identification of amphilectosins as key intermediates in pseudopterosin biosynthesis. J. Org. Chem. 70, 6152-6157 (2005). 53. Russell G. Kerr, Jennifer Boehnlein, Nealie Newberger and Llanie Ranzer. Concentrations of anti-inflammatory compounds increased in culture studies of coral, microalgae. Global Aquaculture Advocate, 70, (2004). 52. Jamie Frenz, Amber Kohl and Russell Kerr Kerr; Marine Natural Products as Therapeutic Agents – Part 2. Expert Opinion on Therpeutic Patents; 14, pp 17-33 (2004). 51. Amber Kohl and Russell Kerr. Identification and characterization of the pseudopterosin diterpene cyclase, elisabethatriene synthase, from the marine gorgonian, Pseudopterogorgia elisabethae. Arch. Biochem. Biophys. 424, 97-104 (2004). 50. Maysoon B. Saleh and Russell G. Kerr. Oxidation of Tyrosine Diketopiperazine to DOPA Diketopiperazine with Tyrosine Hydroxylase. J. Nat. Prod. 67, 1390-1391 (2004). 49. Amber Kohl and Russell Kerr. Pseudopterosin biosynthesis: Aromatization of the diterpene cyclase product, elisabethatriene. Marine Drugs, 1, 54-65 (2003). 48. Laura Mydlarz, Robert Jacobs, Jennifer Boehnlein and Russell Kerr. Evidence that the origin of pseudopterosinn biosynthesis resides in the dinoflagellate symbiont of Pseudopterogorgia elisabethae. Chemistry and Biology, 10, 1051-1056 (2003). 47. Amber Kohl and Russell Kerr A postulated biosynthetic origin of pseudopterosins and a proposed chemoenzymatic production method. J. Indust. Microbiol. 30, 495-499 (2003). 46. Athar Ata, Russell Kerr, Claudia Moya and Robert Jacobs. Identification of anti-inflammatory diterpenes from the marine gorgonian Pseudopterogorgia elisabethae. Tetrahedron. 59, 11389 (2003). 45. J. Cho, J. Choi, I Kong, S. Park, R. Kerr and Y. Hong. A procedure for axenic isolation of the marine microalgae Isochrysis galbana from heavily contaminated mass cultures. J. Appl. Phycol. 14, 385-390 (2002). 44. Noemí González, Jaime Rodríguez, Russell G. Kerr and Carlos Jiménez. Cyclobutenbriarein A, the First Diterpene with a Tricyclo[8.4.0.03,6]tetradec-4-ene Ring System from the Gorgonian Briareum asbestinium. J. Org. Chem. 67, 5117-5123, (2002). 43. Renee S. Thornton and Russell G. Kerr. Induction of Pseudopterosin Biosynthesis in the Gorgonian Pseudopterogorgia elisabethae. J. Chem. Ecol. 28, 2083-2090 (2002). 42. Jinghai Wen and Russell Kerr. Purification and Characterization of the Fatty Acid Synthase from Bugula neritina. Comp. Biochem. and Physiol. Part B, 128, 445-450 (2001). 41. Russell Kerr, Amber C. Kohl, Jennifer M. Boehnlein, “Bioactive Compounds from Bryozoans” in “Marine Biotechnolgy” Volume 6, Elsevier, 2001. 40. 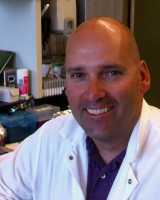 Russell Kerr; Biosynthesis of Marine Natural Products, in “Studies in Natural Product Chemistry”, Elsevier Science Publishers, Amsterdam; Vol. 21 pp 293-328 (2000). 39. Amber Coleman and Russell Kerr. Radioactivity-guided Isolation and Characterization of the Bicyclic Pseudopterosin Diterpene Cyclase Product from Pseudopterogorgia elisabethae. Tetrahedron, 56, 9569-9574 (2000). 38. Shanti Jeedigunta, Joann Krenisky and Russell Kerr. Diketopiperazines as advanced intermediates in the biosynthesis of ecteinascidins. Tetrahedron 56, 3303-3307 (2000). 37. Athar Ata and Russell Kerr. Elisabethamine: a new diterpene alkaloid from Pseudopterogorgia elisabethae. Tetrahedron Letters 41, 5821-5825 (2000). 36. Samina Naz, Russell Kerr and Ramaswamy Narayanan. New antiproliferative epoxysterols from Pseudopterogorgia americana. Tetrahedron Letters 41, 6035-6040 (2000). 35. Athar Ata and Russell Kerr. 12-Acetoxypseudopterolide: A New Diterpene from Pseudopterogorgia elisabethae. Heterocycles, 53, 717 (2000). 34. Amber C. Coleman, Laura Mydlarz and Russell Kerr. In Vivo and In Vitro Investigations into the Biosynthetic Relatedness of the Pseudopterosins. Organic Letters, 1, 2173-2175 (1999). 33. Paul Andrade, Robin Willoughby, Shirley Pomponi and Russell Kerr. Biosynthetic Studies of the Alkaloid, Stevensine, in a Cell Culture of the Marine Sponge Teichaxinella morchella. Tetrahedron Letters, 40, 4775-4778 (1999). 32. R.G. Kerr and S.S. Kerr; Marine Natural Products as Therapeutic Agents. Expert Opinion on Therpeutic Patents; 9, 1207-1222 (1999). 31. Russell Kerr, Richard Vicchiarelli and Stacey Kerr. Identification and biosynthetic origins of sterols in the marine bryozoan Bugula neritina. J. Nat. Prod. 62, 468-470, (1999). 30. Russell Kerr and Kathleen Kelly. An enzyme-based formaldehyde assay and its utility in a sponge sterol biosynthetic pathway. J. Nat. Prod. 62, 201-202, (1999). 29. Jens Knauer, Russell Kerr, David Lindley and Paul C. Southgate. Sterol Metabolism of Pacific Oyster (Crassostrea gigas) Spat. Comp. Biochem. and Physiol.,119B, 81 - 84 (1998). 28. Russell Kerr, Cathy Foss, Shigeki Matsunaga and Nobohiro Fusetani. Isolation and structure elucidation of epipolasterol and 22,23 dihydroepipolasterol from the marine sponge Epipolasis sp. Comp. Biochem. and Physiol.,117B, 5651-563 (1997). 27. Russell Kerr and Lesbeth Rodriguez. A chemoenzymatic production of 9(11)-secosteroids using and enzyme preparation of the gorgonian Pseudopterogorgia americana. In Vitro Cellular and Developmental Biology 33, 20A (1997). 26. Russell Kerr, Lesbeth Rodriguez and Jaelle Kellman. A chemoenzymatic synthesis of 9(11)-secosteroids using an enzyme extract of the marine gorgonian Pseudopterogorgia americana., Tetrahedron Letters. 37, 8301 (1996). 25. Russell Kerr, Joseph Lawry and Kim Gush. In vitro biosynthetic studies of the bryostatins, anti-cancer agents from the marine bryozoan Bugula neritina., Tetrahedron Letters. 37, 8305 (1996). 24. Xueshu Zhang, Ruiwen Zhang, Hui Zhao, Hongying Cai, Kimberly Gush, Russell Kerr, George Pettit and Andrew Kraft. Preclinical Pharmacology of the Natural Product Anticancer Agent Bryostatin 1, an Activator of Protein Kinase C. Cancer Research 56, 802 (1996). 23. Russell Kerr and Neil Miranda. Biosynthetic studies of ecteinascidins in the marine tunicate Ecteinascidia turbinata. J. Nat. Prod. 58, 1618 (1995). 22. Russell Kerr, Kathleen Kelly and Aaron Schulman. A novel biosynthetic route to pregnanes in the marine sponge Amphimedon compressa. J. Nat. Prod. 58, 1077 (1995). 21. Russell Kerr and Zhengjian Chen. In vivo and in vitro biosynthesis of saponins in Sea Cucumbers (Holothuroidea). J. Nat. Prod. 58, 172 (1995). 20. Russell Kerr and Michelle Kelly-Borges. Biochemical and morphological heterogeneity in the Caribbean sponge Xestospongia muta. Sponges in Time and Space, Proc. Int. Porifera Congress, 4th 65-73 (1994). 19. Russell Kerr, S.L. Kerr, Jane Formont, Martin Riddle and Peter Murphy. Chemotaxonomic relationships within, and comparisons between, the orders Haplosclerida and Petrosida (Porifera: Demospongiae) using sterol complements. Biochem. Syst. Ecol. 22, 735 - 52 (1994). 18. R.G. Kerr and P. Southgate; Isolation of gorgosterol from symbiont-free giant clam eggs and larvae. Comp. Biochem. and Physiol 104B, 707 (1993). 17. B.J. Baker and R.G. Kerr; Biosynthesis of Marine Sterols. in "Topics in Current Chemistry" 167, 1-31 (1993). 16. R.G. Kerr and B.J. Baker; Marine Sterols - A Review. Nat. Prod. Rep. 8, 465 (1992). 15. R.G. Kerr, S.L. Kerr, S. Malik and C. Djerassi; Biosynthetic Studies of Marine Lipids 38. Mechanism and Scope of Sterol Side Chain Dealkylation in Sponges; Evidence for Concurrent Alkylation and Dealkylation. J. Am. Chem. Soc. 114, 299 (1992). 14. R.G. Kerr, S.L. Kerr and C. Djerassi; Biosynthetic Studies of Marine Lipids 26. Elucidation of the Biosynthesis of Mutasterol, a Sponge Sterol with a Quaternary Carbon in its Side Chain. J. Org. Chem. 56, 63 (1991). 13. R.G. Kerr, S.L. Kerr, G.R. Pettit, D.L. Herald, T.L. Groy and C. Djerassi; Sterols of Marine Invertebrates 63. Isolation and Structure Elucidation of Sutinasterol, the Major Sterol of the Marine Sponge Xestospongia sp. J. Org. Chem. 56, 58 (1991). 12. R.G. Kerr, B.J. Baker, S.L. Kerr and C. Djerassi; Biosynthetic Studies of Marine Lipids 29. Demonstration of Sterol Side Chain Dealkylation Using Cell-Free Extracts of Marine Sponges. Tetrahedron Lett. 31, 5425 (1990). 11. R.G. Kerr, I.L. Stoilov, J.E. Thompson and C. Djerassi; Biosynthetic Studies of Marine Lipids 16. De Novo Sterol Biosynthesis in Sponges. Incorporation and Transformation of Cycloartenol and Lanosterol into Unconventional Sterols of Marine and Freshwater Sponges. Tetrahedron 45, 1893 (1989). 10. S. Malik, R.G. Kerr and C. Djerassi; Biosynthetic Studies of Marine Lipids 19. Dealkylation of the Sterol Side Chain in Sponges. J. Am. Chem. Soc. 110, 6895 (1988). 9. M.L. Cordeiro, R.G. Kerr and C. Djerassi; Biosynthetic Studies of Marine Lipids 15. Conversion of Parkeol (Lanost-9(11),24-dien-3b-ol) to 14a-methylcholest-9(11)-en-3b-ol in the Sea Cucumber Holothuria arenicola. Tetrahedron Lett. 2159 (1988). Research is currently sponsored by the following agencies.